Note: Chef Arnaud Bignon has now left Spondi to cook at The Greenhouse. En route to the Greek Islands I stopped off in Athens to be greeted by sunshine and hot weather. Despite all the charms of Scandinavia, I found it a wee bit cold and grey (not to mention exceedingly expensive). I had considered going to France for some further gastronomic pursuits, but in the end I chose the sun over my stomach. The powers that be must have smiled at my choice for they seemed to stamp their seal of approval by sending some fine and dandy traditional Greek tunes through the taxi radio as I made my way from the airport. It left me reeling with flashbacks of all my favourite scenes from My Big Fat Greek Wedding and the realisation that I really was in Greece! I love that movie, and from that point onwards I was a lost cause for the mere sight of the word ‘lamb’ on a menu would immediately transport me giggling to that scene where she tries to explain to her aunt that her fiancé is vegetarian. I liked Athens. There is of course the Acropolis, but its collection of historical treasures is not limited this to national monument. The Acropolis Museum which opened in June is absolutely spectacular, as is the National Archaeological Museum which surely houses one of the best collections in the world. And interestingly, the subway system is similar to an interwoven network of modern construction and underground ruins. Now to the more important matter of food. I hadn’t originally intended to eat at any of the high end establishments while I was in the Greek capital as this was meant to be the ‘sun’ part of my trip. 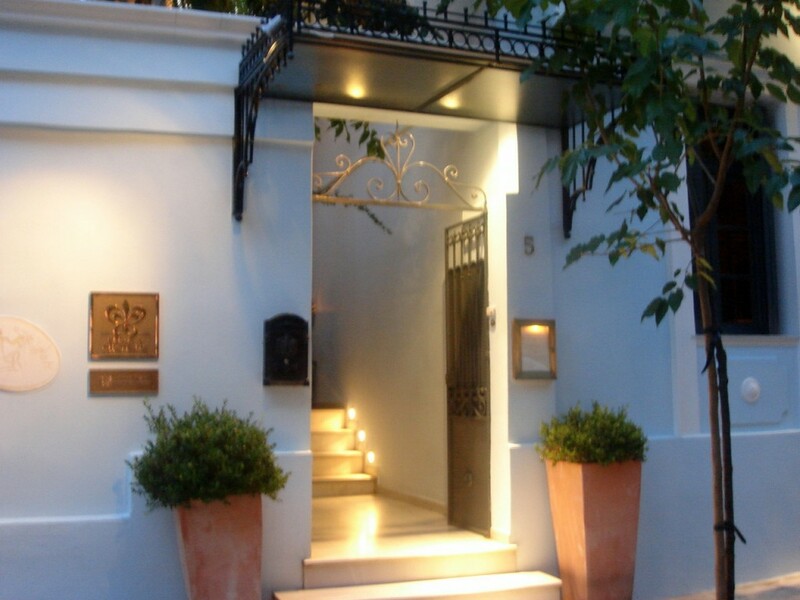 But try as I might, I couldn’t help but do some research before coming to Athens to discover that there are three restaurants here with Michelin stars, one two star and two one stars. But the powers that be seemed to have their say again. A chance meeting with a foodie friend of mine from London, in of all places, in a restaurant in Copenhagen (small world), resulted in a conversation that convinced me that I ought to try the two star, Spondi. He hadn’t been to Spondi, but a foodie friend of his had and highly recommended it. As he trusted the opinion of his friend, and I trusted the opinion of mine, I was thus convinced that I had better go. To clarify, Spondi does not serve Greek, but French food. The head chef is Arnaud Bignon, a Frenchman, who previously worked at Alain Ducasse, Drouant and the Bristol. He took over the helm of the restaurant in 2005 and his efforts in the kitchen were rewarded when the restaurant, which opened in 1996, won its second star in 2008. A Relais & Châteaux restaurant housed over three floors, the restaurant is a statement in refinement, with its dark leather seating and fine linen table cloths. There is also a lovely garden terrace dining area lit with romantic lights which is where I dined. To kick off my 6 course discovery menu (€115), a seafood menu with no meat (and therefore no lamb) were four amuse bouches. 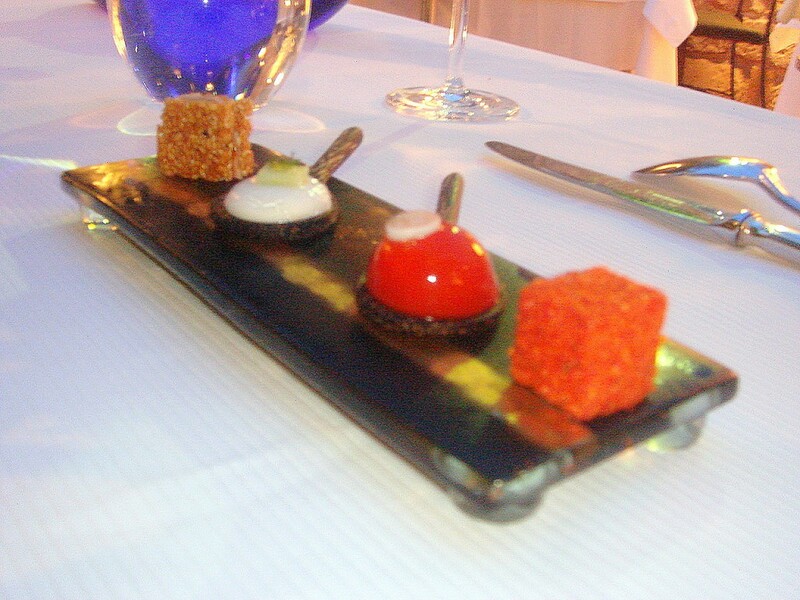 From right to left in the picture, the first was a tomato marshmallow with soft spices. This was not particularly tomato-y and was a little powdery from the coating of spices. Next was a spherified drop of Greek salad with a liquid centre. This was cleverly done for it tasted like a Greek salad, that is, of feta cheese and cucumber, etc. Next was a dollop of tsaziki, yoghurt and cucumber which was fresh and light; and a toast topped with flavoursome smoked eel and caramelised sesame seeds, the combination of which worked well together. A sea bass tartare with celeriac was delicious. The sea bass on its own was very flavoursome, and the celeriac, used sparingly throughout the tartare, enhanced the fragrance of the fish. This was accompanied by a ‘snowball’, a very cold savoury meringue (a little too cold for my liking), which had been generously filled with luscious little balls of sweet herring caviar. 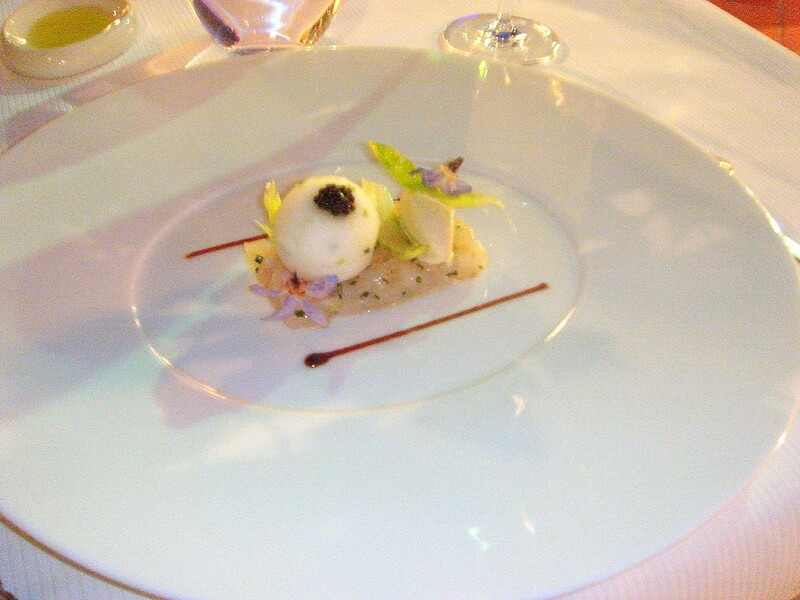 The caviar was a decadent touch, and when eaten with the tartare was superb. 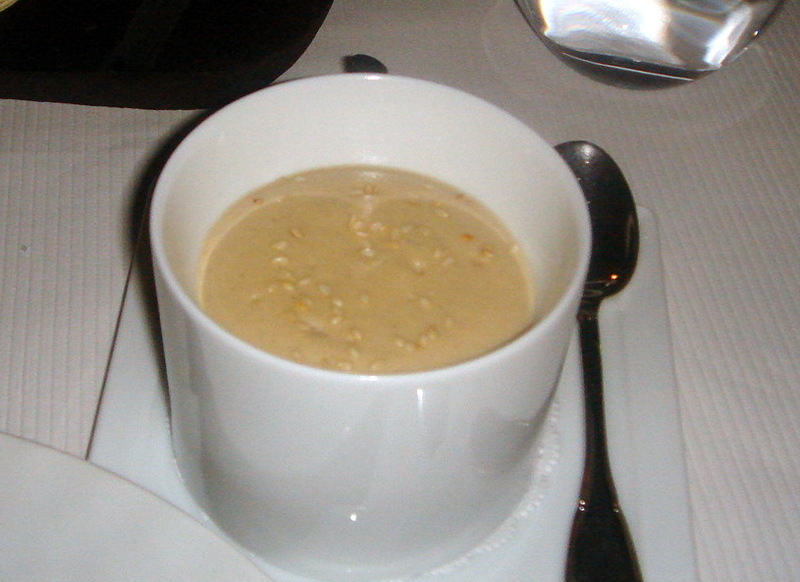 There was also some oyster sorbet which provided a creamy contrast. Despite the temperature of the snowball, this was an excellent dish overall. The tartare was followed by two plump and perfectly cooked scallops drizzled with tandoori powder. The tandoori effect was done well, for it did not overwhelm the delicate flavour of the scallops which were a little heavily seasoned. Served with a foam of ginger and candied lemon butter, the subtle hints of ginger and lemon tasted lovely with the scallops – their acidity helping to cut the more powerful tandoori flavour. 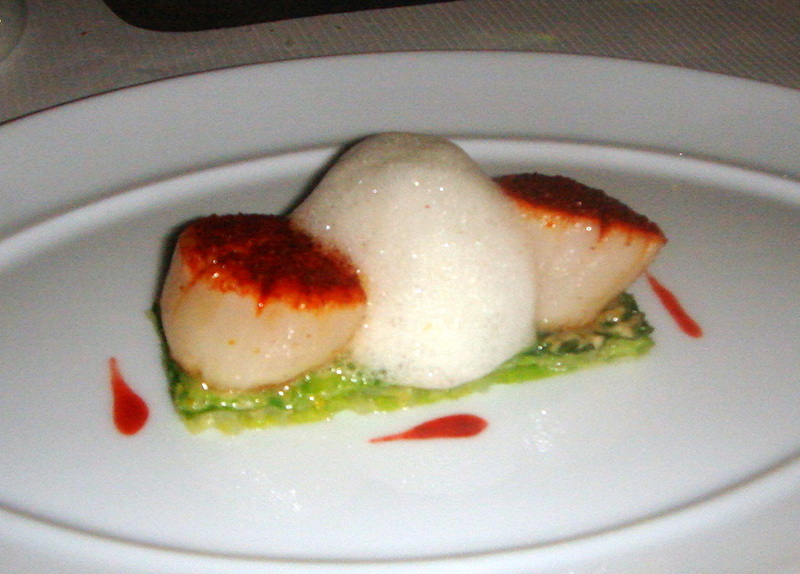 The scallops had been placed over a bed of cabbage. This was perfectly cooked, but presented as slivers rather than finely sliced, it was a rather cumbersome to cut. The next dish was also excellent – cod poached in a verbena butter and topped with tamarind pasta. 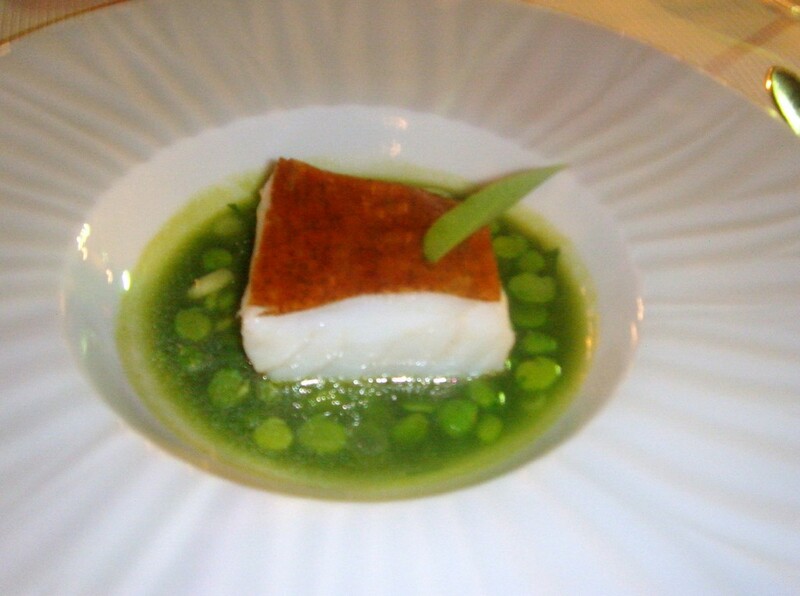 The cod, a thick generous piece, was moist, and was served in a broth of peas and verbena butter. The peas maintained their bite and the there were gentle hints of lemon in the light verbena butter which accentuated the sweetness of the fish. There was a nice firm texture to the tamarind pasta, but it did not have a particularly strong taste. 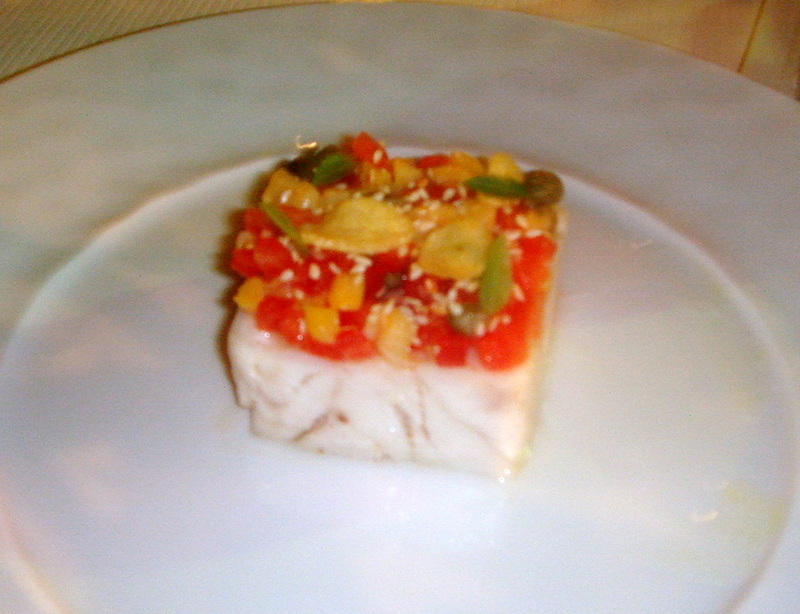 The final fish course was a grouper, slow cooked, and topped with a tartare of tomato, lightly roasted garlic, capers and sesame, which, with its hints of sweetness, saltiness and crunchiness complemented the fish nicely. But there was no liquid in this dish such as a sauce or a broth, and it needed some form of moisture to lift it for eating the fish on its own was a little dry. There was also a side of homous foam which was light and airy. This dish was pleasant, but the least successful of all the seafood dishes. 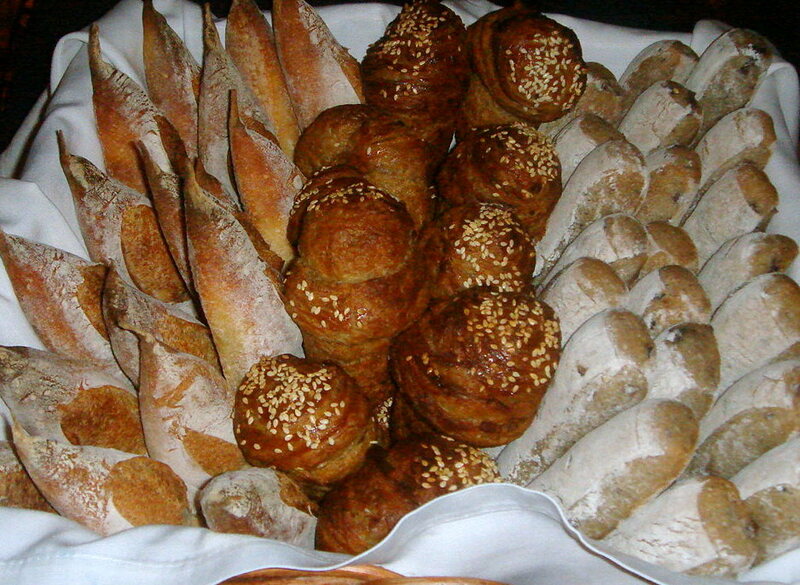 Breads were delicious and included a traditional French baguette, which made a hollow sound when knocked but was not quite doughy enough on the inside; a tasty olive bread; and a feuilleté (a bread made from puff pastry dough) with sesame and bacon. The latter was flaky on the outside but doughy on the inside. The tasting menu included a cheese course. Most restaurants charge a surcharge for cheese, so its inclusion here was a nice touch. The waiter offered me a selection of six cheeses which I won’t bother to list. The cheeses were good, but disappointingly, no chutney or grapes were offered with them and were much needed. 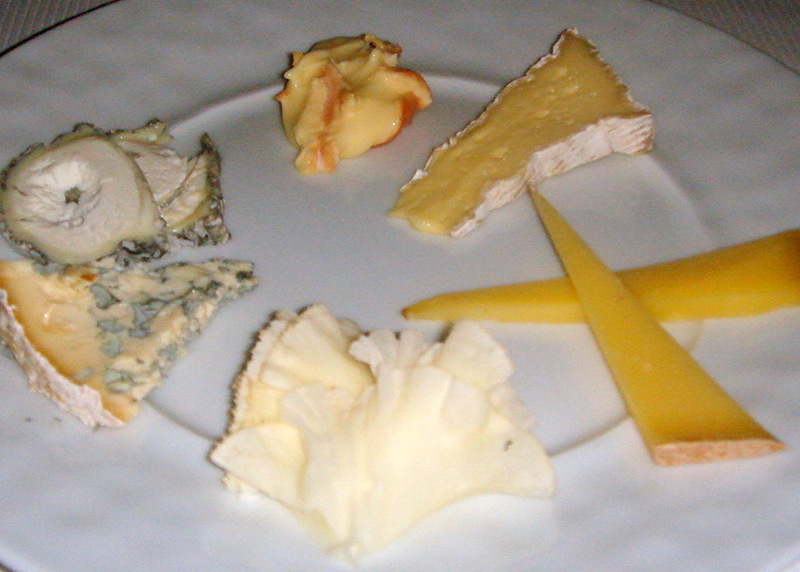 Furthermore, the cheeses were arranged in a rather curious order – the waiter placed the lighter tasting Sainte-Maure de Touraine goat’s cheese after the stronger Époisses. Pre-dessert was a sorbet of cream cheese and orange with marinated fig and strawberries. 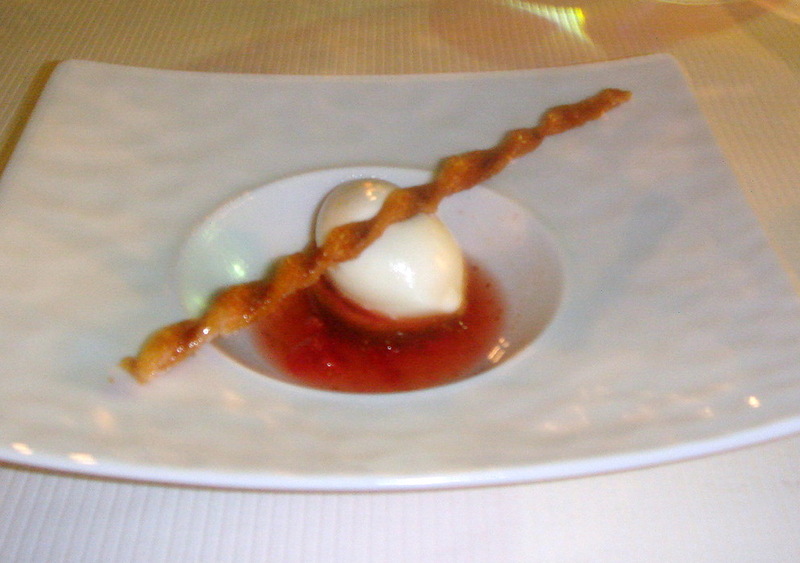 The sorbet was excellent, with a strong taste of sweet orange, but not so strong as to overwhelm the soft fig and the natural sweetness of the strawberry broth. The combination of the flavours in this course was extremely harmonious. The first dessert was a mixture of berries (strawberries, raspberries) with a vacherin and vanilla ice cream, raspberry sorbet and little bite sized pieces of crunchy fluffy meringue. The berries were a little sour, but the subtle hint of vacherin in the ice cream was delicious. 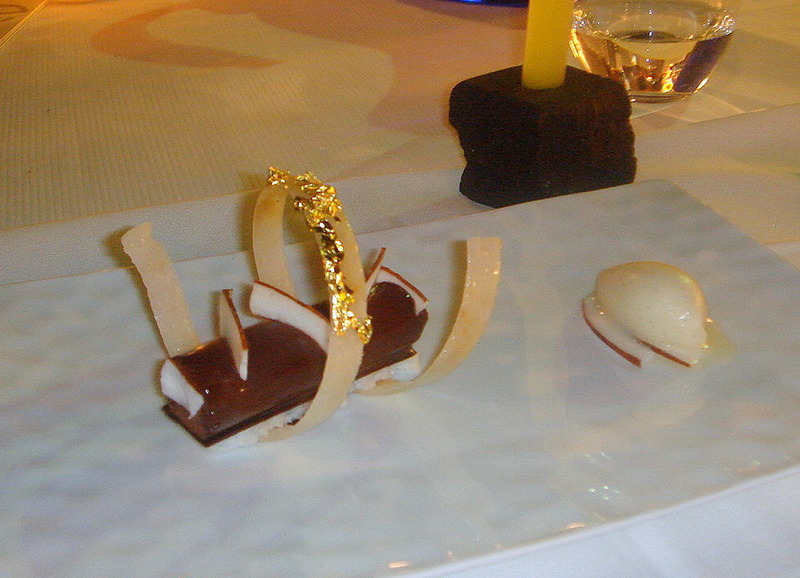 The final dessert was a ‘Bounty’, a chocolate mousse coated with chocolate, encased in fresh coconut and coconut biscuits, and served with a vanilla and lime sorbet. The mousse was delicious, although the sorbet was very tart and the acidity of the sorbet clashed slightly with the richness of the mousse. There was also a side drink of pina colada which was presented in a test tube. Petits fours included an interesting array of items. From left to right, there was a strawberry and lime soda which was like drinking fizzy strawberry air and was very refreshing; a fruit salad with melon and verbena which was a little bland; a chocolate coated passionfruit ice cream which had a nice zing to it; a white chocolate coated cardamon and lemon ice cream which, when you bit into it, burst forth with cardamom flavour; tapioca chips which were not crunchy; and some fluffy vanilla and raspberry macaroons. The service was slick, professional and well timed. But there was a constant stream of waiters walking back and forth between the tables which I found disconcerting. And at certain junctures, there were two waiters serving one plate of food which I thought was a little ‘over the top’. Despite this, the food was excellent. There were minor elements in certain dishes that didn’t work quite as well as they could have. Otherwise, the technique was pretty flawless. Bignon has an exceptionally subtle touch in his cooking, and this is where he seems to excel – at adding delicate hints of secondary flavours to his dishes that work well with the key ingredients and which help to make them sing. The cheese course needed improvement, but the excellence of the cooking at Spondi makes it a worthy two star restaurant. Starters – €32 – €38, mains – €38 – €50. 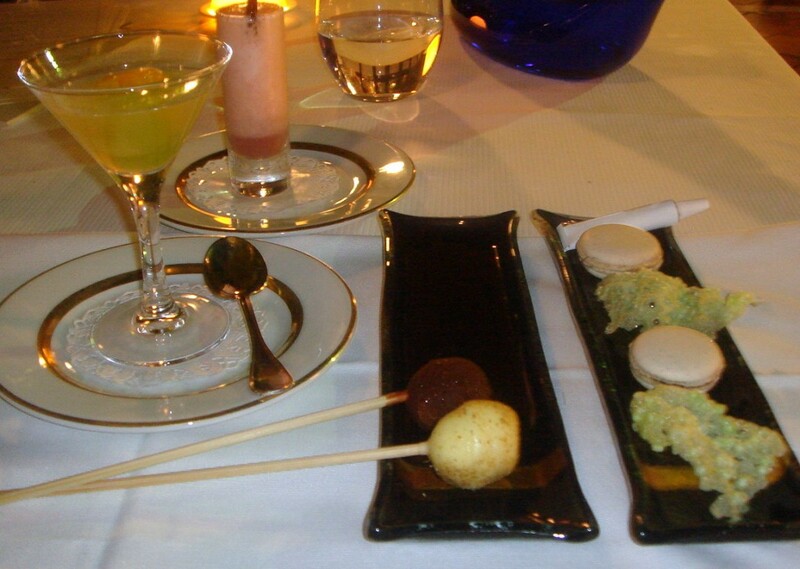 The four course ‘imitation menu’ is €70. The Discovery menu accompanied by 4 glasses of Greek wine is €143, and accompanied by 6 glasses of International Grand Cru wines is €180. As always it looks fantastic, I wish I was there! girl, you’ve eaten in more Michelin star restaurants than I’ve eaten bacon and eggs for breakfast! :) good on you! when back? i’m discovering the cheap and cheerful in my neck of the woods – you should join! Funny that you should be here at the same time as me…too bad I didn’t bump into you, I would have shown here some awesome places to have some very unusual Greek food… not fancy, schmancy frenchy. How about Greek-style Ma Pa Do Fu? Made with lamb not pork. I know the place you went to. The Greeks love it because they don’t have to eat Greek (and occasionally I don’t blame them), but they love to go and show off how cosmopolitan they are. BAH! This is my last night in Athens. My dinner was cod baked with garlic, baked herb pita pockets, mashed fava beans, sardines soaked in vinegar and oil, a GREEK snail dish with onions and tomatoes, and for desert strained yoghurt with a sour cherry sauce. A grand slam dinner combo at one of my favorite local restaurants. PS: Did you see how the anarchists paint-bombed the Acropolis? Protesting elections indeed. It’s vandalism, period. sometimes I can’t keep up either. 🙂 It has been a bit of a whirlwind trip! yeah you must do your big trip at some point too. I know you will love your gastronomic discoveries. I will be in touch soon so we can catch up over more food! it is a shame. I would have loved an insider’s knowledge to the food in Athens. As for the Acropolis, I missed the paint-bombs, but I agree, it’s vandalism. Then again, Athens has a disgusting amount of graffiti.